This is data on our 2019 Salary Guide. We've collected data through a survey to our clients and candidates, analysed it for easyer view. As anyone can see, the most important aspect for people was "Career progress," even over "Salary." This shows people want a chance of growth in their company. This was not the results we were expecting. The important thing is the meaning of these results. Career progress, over salary, company culture, and employee benefits means that people want more credibility in the work they do. Many of the Japanese companies still evaluate their employees by age and how long they have been in the company. The longer you stay and work, the more you are seen to contribute to the company. Therefore, if you leave a company, your value is lost and reset to zero. That is one reason why people have a strong desire for career progress and a reliable performance evaluation system. 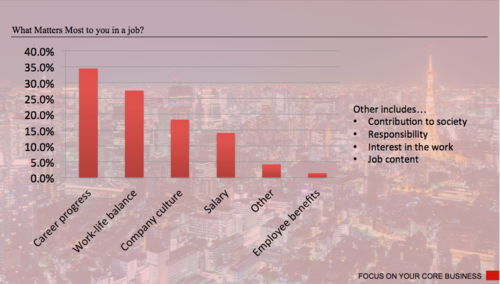 “Work-life balance,” ranks second, followed by, “Company culture.” Employees in Japan are beginning to refuse to work overtime and long hours, with a greater desire for personal time. In the past, there was only enough time for maintaining the home without any emphasis on self-development and pursuing hobbies and further education. As “Career progress” is important for most of the people polled, employees want recognized for their work. What we have found is that this does not mean employees lack passion for work but rather, they want their career as one part of their life fulfillment. “Company culture,” “Salary,” and “Other,” were less than 20%. More than half of the answers are concentrated on career progress and company culture. For us, this was a surprise, but excellent feedback for employers and company leadership. It is apparent from our results, that to attract employees career progress and work-life balance are key. A great “thank you” to all who participated on the survey! We plan to create another salary survey next year. In order, we will be sending out another, updated salary to make a comparison to this one. I will let you know when we send out the survey, so please look forward to participate in bettering your work experience. Thank you.